Smart clothing is advanced fusion of technology and fashion, an innovation that turned fantasy into reality. Smart clothing represents the next generation of clothes with value-added functionality like tracking individual’s biometrics, response to environmental changes, and more. Smart clothes unlike other smart wearable (smart watches) do not require be charging. Thus, companies are shifting their focus towards developing smart clothes instead of focusing only over smart watches and smart bands. Along with the growth of global smart wearable market, growing at a rate of 18.7% annually, smart clothing market growth is accelerated. Smart clothing market in healthcare industry has enormous growth opportunity accounting for a USD 15 billion market, where major application being the injury prevention data availability, which can reduce 50% of the sport-related injuries. Similarly in military, smart clothing provide wound detection, protection against injuries and health and stress monitoring. Such smart clothing solutions for military are being funded by government such as by U.S. Military, such as Defense Department planned budget of USD 75 million in 2016 for textile technology research speeding the growth of global smart clothing market. Goldstein Research analyst forecast that the global smart clothing market size is set to reach USD 1175 million by 2025, growing at a CAGR of 29.3% over the forecast period. The technological advancement, fashionable looks, personal disposable income, demand from various sectors, among others are some of the factors affecting the growth of global smart clothing market. 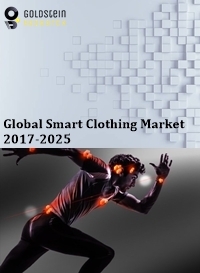 The report covers the present ground scenario and the future growth prospects of the smart clothing market for 2017-2025 along with the global sales and global revenue of the smart clothing. We calculated the market size and revenue share on the basis of revenue generated from major players across the globe. We have forecast the market on the basis of smart clothing manufacturers, smart fabric suppliers, smart clothing suppliers and distributors, demand and supply chain, smart wearable industry, fashion industry mergers and collaborations. On the basis of functions, biosensors acquired largest market share of 48.7% in 2017. Biosensors embedded in clothes keep the person fitness focused, workout results, and trainings from the recorded data, injury prevention and injury detection, and more that attract not only the athletes but also the defense sector towards the use of smart clothing. Application of smart clothing in Athletics is expected to have largest contribution in the total smart clothing market share over the forecast period. Smart clothing market outlook 2017-2025, has been prepared based on an in-depth market analysis from industry experts. The report covers the competitive landscape and current position of major players in the smart clothing market. The report also includes porter’s five force model, SWOT analysis, company profiling, business strategies of market players and their business models. Global smart clothing market report also recognizes value chain analysis to understand the cost differentiation to provide competitive advantage to the existing and new entry players. Application of smart clothing in defense sector is the rising trend faced by smart clothing market, contributing towards its growth in the near future. Researchers are developing smart clothes embedded with sensors and communication systems, in order to detect the soldier’s location, wounds, environmental analysis and more benefits. The fabric used are less than 1mm in diameter, but as strong as steel. There is an impulse among top vendors and technology developers to include the smart wearable as a part of people daily living, instead of treating it as a technology device. Thus the technological advancement is the major factor driving the smart clothing market. Smart clothes such as wearable solar clothes, are inspired by solar-powered technology that can provide connectivity and supply energy to charge the devices like mobile phones, tablets and others. These are also considered as eco-friendly garment. High cost and lack of awareness are the major challenges hindering the growth of smart clothing in various segment of population. The masses are unaware of these technologies and their benefits. There is lack of promotion of product and its advantages, causing unawareness among the potential population. Based on geography, North America accounted for largest market share of 36.2% in 2017 of the total global smart clothing market. Presence of both large players and consumers of smart clothing in this region are the major factor impacting the growth of North America smart clothing market. Asia-Pacific rising personal disposable income, is expected to significantly contribute in global market share over the forecast period. Countries such as China, Russia, and the U.K. have highest military expenditure, thus being the opportunistic countries for the growth of smart clothing market. Global smart clothing market report comprises of the following companies as the key players in the smart clothing market: Hexoskin, Heddoko Inc., Ralph Lauren, Athos, Sensoria Inc., Catapult Sports Pty Ltd., Poikos, Thethings.io, Omius, Wearable Technologies Ltd.
What is the total market size by 2025 and what would be the expected growth rate? What is the revenue of smart clothing market in 2016-17 and what would be the expected demand over the forecasted period?